We buy 2nd hand Trucks at the best prices around. If you no longer need or want your Truck and are looking for cash give ABCM Car Removal a call. We handle the removal of all types of vehicles including small and large trucks. As auto wreckers, dismantlers and recyclers we will strip your truck for parts and resell the scrap metal. So it doesn’t matter if the truck is damaged or not even running. Our truck removal service operates across Newcastle, the whole Hunters Region and Central Coast. Have a truck that has just suffered an accident or a damaged truck you want to get rid of it? What if I say you could get rid of it for free and moreover – you could get some money for its removal? ABCM Car Removal provides exactly this. Our company has more than ten years of combined experience in vehicle removal and is one of the best choices in Newcastle and surrounds. At ABCM Car Removal we buy and remove accident damaged trucks, cars, bikes, utes, 4x4s and many other vehicles of any age or condition. We buy and remove the absolutely FREE! Firstly, we always offer the highest possible price for your truck. Secondly, we accept trucks in any possible or even impossible condition. Thirdly, all the required paperwork is provided by us. Fourthly, we don’t need for your vehicle to be repairable. Fifthly, we never ever make things a hassle. Finally, you don’t need to do any heavy work. Unwanted old and damaged truck removals and disposals. All of other types of vehicle removals and disposals. How does our Truck Removal Process Work? In the beginning, you contact us. 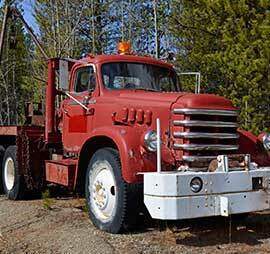 Describe your problem, tell us what kind of Truck you have and its condition. This helps us estimate the price of the vehicle. Once we’ve agreed on the price we will schedule the most convenient time for you. We are flexible to your needs. When our truck removal team arrive, they will give you all required papers, waiting for your signature. Just show us your passport, Photo ID or drivers license to ensure that you are the owner of the vehicle. If everything is ok, you’re given cash at once and we tow your truck. The deal is concluded only after the money is paid. All you have to do is call, describe the problem, tell us your time, sign some papers and get your money. Simplicity and convenience – that’s what makes our company one of the best in New South Wales! Not only our service is outstanding, but also our staff are polite and courteous and will always give you a hand. Just think for a little moment what is better: to bother looking for a very expensive and time-consuming repair and then waste even more time looking for a buyer. Or just to call ABCM Car Removal, who will give you top price at once? We think the answer is pretty obvious. If you and your truck are located in and around Newcastle, Lake Macquarie, Port Stephens, Maitland, Toronto, Cessnock or the Central Coast give us a call now to get the best cash offer.